Luka Chuppi, the comedy romantic-drama directed by Laxman Utekar was released this month on March 1st with immense excitement of Kartik Aaryan fans as well as audience. As expected the movie has impressed all its viewers and received very positive reviews from most of the critics. In the opening week, on an excellent note Luka Chuppi did the business of 53.70 crores from around 2100 screens across the country. In the second week too, it remained strong and registered the business of 21.54 crores domestically. In it’s third week, the movie witnessed usual dip but still managed to garner the good business of 11.75 crores. Now it is running in fourth week and enjoyed the weekend on a decent despite new much anticipated release Kesari. Dinesh Vijan’s this production venture minted the amount of 2.39 crores in the fourth weekend, which was including 0.61 crore of Friday, 0.81 crore of Saturday and 0.97 crore of Sunday. Once again Luka Chuppi is in weekdays and getting lesser occupancy in theaters. On it’s 4th Monday, the movie faced decent drop and added the amount of 0.43 crore. Then on Tuesday, it remained steady and minted 0.36 crore. On the next day i.e. 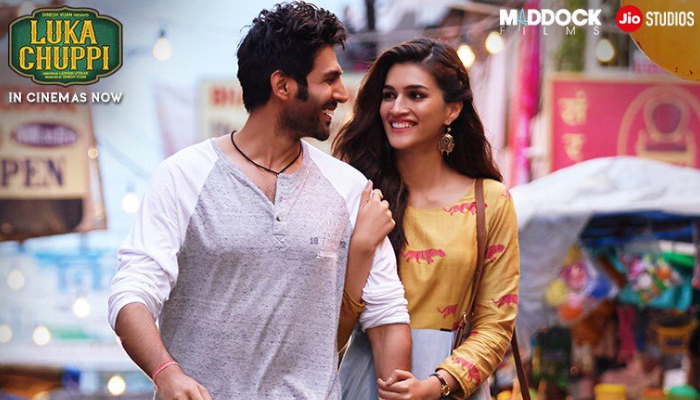 Wednesday, Kartik-Kriti starrer managed to collect the amount of 0.43 crore and made it’s 27 days domestic total as 90.60 crores.